02/09/17: Camps are here, along with a clear focus for the gameplay and game in general! 22/02/17: Monster body parts plugged into genetics engine for first time! 11/02/17: Shortened the name again, and it may change again because I'm indecisive. Also: new GUI, finally! 28/1/17: Updated the name. Still might change, but this is more reflective of the game's focus and tone. Original post: Having spent the last couple of months building and tweaking a simple genetics simulator tool in Unity, including a usable but crude custom inspector, it's time to draw a line underneath engine building (as fun as that is) and actually make a thing with it - and to keep myself honest and accountable, it's devlog time! "In order to take over the world, you must perfect a breeding program to create the biggest and best monsters. Capture prime specimens from the wild, select the most desirable qualities, throw in a little genetic modification and create super monsters." Its gameplay would revolve almost entirely around the selection and combination of your monsters. 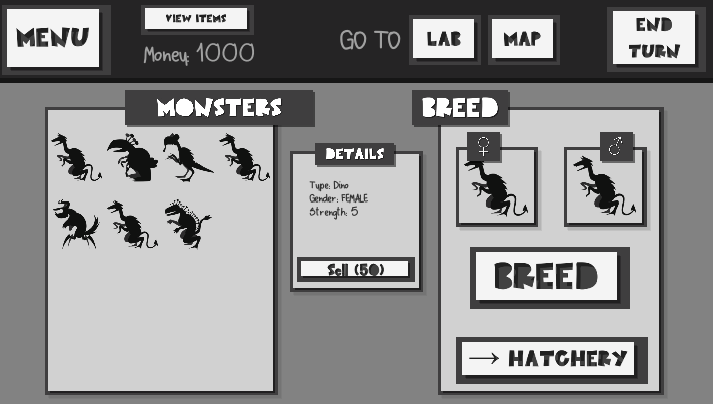 I've always enjoyed the idea of Monster Breeding, a game on Kongregate (not made by me obviously!) which I've taken a lot of inspiration from. But Monster Lab will feature more complex genetic combination, which is my focus, and I hope I can make it fun and interesting. Any game tasks (such as capturing wild monsters and attacking places) will be extremely simplified and depend on the quality of the monsters you choose to carry it out, tying back into the breeding program element. Although I haven't made any progress towards the above concept yet, I can outline how my genetics tool works, with some gifs! While building it, I built a super crude scene which allowed me to generate creatures, select two and breed them together. Since my focus was just on the engine, I used these sphere blobs as my test subjects, and they worked perfectly well to test my functionality, so in order to show it off I've decided to keep them as my beautiful assistants! Of the above, the left/right ear blobs exhibit dominant/recessive characteristics; having the ear blob is dominant. So while a creature with a left ear blob could have a baby without one, a creature without one cannot have a baby with one. You might notice some strange colours coming out of this - like green babies from brown and blue parents. This isn't accidental or a bug, but because of how their colours are defined, and the fact that these creatures are totally randomly generated so they have very variant genes. Because these creatures have two chromosomes, and randomly inherit one chromosome from each parent, they sometimes look quite different. By inbreeding for a couple of generations it's easy to get much more predictable colours as the genes become less diverse between the two chromosomes, as you would expect. Since this is built in Unity, I wanted to show quickly what the inspector looks like for the Creature script. I love it when other devs get into the guts of how they designed their systems so I'm gonna do the same. In this gif, I generate some creatures and then look at the 'Chromosome' part of the inspector. In this you can see a long string of 0s and 1s which make up these creatures' two chromosomes. Below that is the chromosome broken down into its individual genes so you can see where the values come from. Each gene is made up of a number of 0s and 1s from both chromosomes, and then its overall value is the mean of those values. Genes exist to generate a number between 0 and 1 which can then be interpreted however you like. For size, I treat 0.5 like the average size, and then normalise it to a range like 0.7 to 1.3, and then use that last number as a multiplier on the creature's scale. So gene values above 0.5 generate a larger creature, gene values under 0.5 generate a smaller creature, and values of 0.5 generate an identically sized creature. To explain where the values come from, as seen in the gif, the blue creature's Right gene is 2 digits long and, as seen on chromosome 1, is 00. As seen on chromosome 2, is 00. (((0 + 0) / 2) + ((0 + 0) / 2)) / 2 = 0. If any of those 0s had been a 1, then the value would have been above 0 and the creature would have been born with a right ear blob. You can see that this creature's size genes are pretty consistently 'small', so no matter which chromosome its children inherit, they'll inherit 'small' genes. A creature with two genes of 00000 and 11111 would itself have an overall value of 0.5, making its own size 'average', but half of its children would get a 'very very small' gene, and half would get a 'very very big' gene. Finally, after wrangling with Unity's custom editor for way too long, I was able to create something usable in order to use the near-full functionality of the engine purely inside Unity. I want to build on this a lot more in the future, but it's fine for now. So in the gif below I'm looking at the Creature script again, but this time at the 'Phenotypes' part, which defines what physical (or hidden) attributes the creature has, which body parts a particular phenotype affects, which colours it affects, how many genes contribute to that particular phenotype, etc. I'm not going to really dig into how it works right now, but I have lots of plans to make it richer in the future. If I can make it really nice then I'd like to be able to release it as a standalone asset one day. Cool idea, keeping an eye on this. I always thought a breeding game could make an awesome strategy game, to bad nothing has really pulled it off right yet. Hope you can make it happen! Would love to play a good breeding game. Monsters will have one stat - ATTACK. All of the above will either be entirely cosmetic or contribute to this attack stat in some way. Attack will probably also be affected by a hidden genetic attribute of strength. Will just be a 2D map with points of interest (either cities or countries) which you can select and send monsters to assault. These areas will have DEFENSE stats which is compared with the ATTACK stat of the monster. Yay simple. There'll probably be no reward or anything for winning or losing in this version. Might kill a monster which loses. Will just be a random assortment of totally randomly generated monsters that you can click to collect, so long as you haven't filled up the max capacity. Unsurprisingly, I started to figure out what I'd need for my monsters and almost immediately knew that the tool wasn't ready. Typical. So I've spent some more time adding the functionality needed for the scope described above, and, not wanting to waste time playing around with art assets (knowing that I'm easily distracted enough without throwing that into the mix yet), decided to shamelessly abuse poor Pokemon birds. The monsters will be 2D so it made sense. It's a lot more exciting to me than anybody else at this stage! A lot is happening behind that button click. Also, I deliberately tried not to spend too long getting things to line up perfectly because it really doesn't matter at this stage. Similarly, I've not affected the colours or anything, sooo they're all the original colours of whatever pokemon I butchered to create that particular frankenstein. Before I leave this behind, I'm just going to re-add the breeding-together functionality, so that I can make sure that all works as intended, but I don't see why it shouldn't. I just want to see what comes out of some of these hideous mutants. Aaaaand in playing with it, realised I have made a fairly fundamental oversight in my tool which will need fixing. Or... maybe this can just stay in as a horrible example of what can happen when you have genetic mutations, ahem, incompatible with life. Might play with these more in order to learn how best to incorporate colour shifting so that I can add that to their genes too, since I want colour to be an aspect of the monsters, but probably just an aesthetic/superficial one. I could have included size in this but couldn't bring myself to scale pixel art up/down, so will be moving to vector-type art for the monsters so that they can vary in size without looking horrendous. I spent some time defining the minimum product and key features some more, and then was able to start iterating. I took some gifs of the full functionality so far at the end of each version, for prosperity, and because having that rich history is important to me, even this early on. While I promise I'm actually quite interested in UX, my focus right now is almost entirely on gameplay and functionality. To that end, this uses all default Unity UI stuff, names from Pokemon and monster sprites from Dragon Quest, because those games were the best and I love its monsters. I'll be replacing the monster art with my own as soon as I decide to hook the genetics engine in. What's in the gif: A menu with 3 locations and exit. 'Lab' takes you to a scene which shows all currently owned monsters, and the player inventory, which right now just holds generic 'money'. 'Map' takes you to a scene with some randomly generated and placed targets that you can attack with monsters. 'Wilds' takes you to a scene with some randomly generated monsters, which you click to capture at a cost of 50 (so with the starting amount of 100, can only catch two at first, though this isn't clear at all since you can't see the inventory from this scene!) 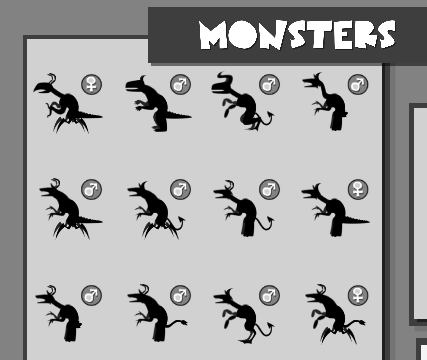 Then these monsters are visible in the lab, and clicking on them gets some details about them that wasn't known before, namely their Strength value and thus their sale value. Monsters can be sold for cash. Going back to the Map scene, the targets can be selected to view their Defence value. A monster can only attack a target if its strength exceeds the target's defence. At this point there are no limitations to how much you can attack targets so money is trivial so everything is trivial... but hey, you can interact with it, so yay. What's in the gif: The 'Map' now contains multiple zones, each of which function like the previous 'map' insomuch as they have multiple targets to attack, but they also contain one Wild site to catch monsters. Zones are predefined and not random, and each higher zone contains targets with higher defence and higher value, and monsters with higher strength and higher capture cost. Zones above 1 need to be unlocked with money. Zones can only be attacked once, which is more important to later versions because it really adds nothing to the gameplay at this point. Not that there is much gameplay yet anyway. Still, there's something satisfying about collecting monsters in order to attack targets to unlock zones to get better monsters... and that I can enjoy a loop even this basic is encouraging. There's no gif for this because it was largely a behind-the-scenes thing and not very visually different. Essentially, all attacks against a target have a %chance to succeed, fail, or critically fail. This chance is affected by the disparity between monster STR and target DEF, and is 50/50 if those two variables are the same. Success chance goes up as STR rises above DEF. Success results in money earned, the target's value decreasing (pillaging ain't good for the local economy) and a small chance for the target to become 'ruined' and unattackable, which is the same functionality as in 0.2 where targets couldn't be attacked more than once. Failure results in nothing happening. Crit failure results in the attacking monster dying and being removed from the player's inventory. No matter the outcome, everytime an attack happens, there is a small chance of a previously-ruined target to repopulate itself and become a viable target again. Have updated the name to the new working title, which will be the final title so long as I still like it. I'm hoping to go for a Dr Horrible's Evil League of Evil/Dungeon Keeper/campy villain type mood with crazy monster creation and attacking of (not-so-undefended) cities and places... where you may also participate in monster showing (as in, with awards and competitions and ribbons and such) to show off your amazing meticulously bred and raised monsters. Because I've long toyed with the idea of an animal showing/breeder game and this seems perfect. Who doesn't want a nice red ribbon for the monster who can get through a metal barrier the fastest using only their acidic spit? Anyway. More progress on basic functionality. These gifs are pretty bad quality... should look into better software. - Clicking an egg shows some details of its parents. Clicking a hatchling shows some details of the monster, which at this point means showing everything except its strength, because I want some aspects of a monster to be unknown/undeveloped before its fully matured, so that every stage of growth reveals a little more about it. 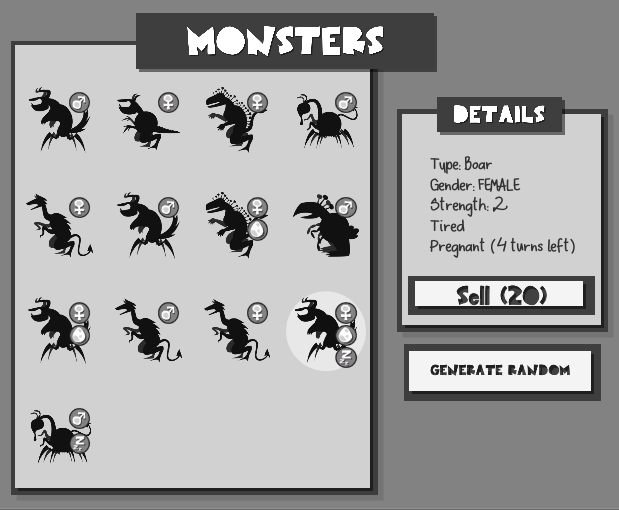 With the current version of monsters, this process is incredibly oversimplified, because monsters consist only of a few variable things: breed (sprite), strength, gender. So any offspring is still very simple. But the process is essentially complete, in that it can simulate the full circle of life, so all my hooks are in place for when I make their genetics far more interesting. I could introduce colour into this version to make it more diverse, since these sprites are all very single-hue, but they won't be staying placeholder for too much longer so that is a waste of effort. It's all about the testing and getting core functionality in right now. Next version - turns! So that everything is not just an endlessly repeatable, free and instantaneous action. - A monster becomes tired after performing an action, which is currently limited to breed or attack. A tired monster cannot do anything else, and will become refreshed at the beginning of the next turn. - A target can only be attacked/pillaged once per turn. - Targets can randomly increase their value and being unruined at the end of each turn. - The circle of life is no longer instantaneous, but linked to turns. When two monsters breed, the female becomes pregnant. A pregnant female cannot breed again until she has laid her eggs. A female is pregnant for a random number of turns, after which she lays her eggs. An egg similarly has to wait for a random number of turns before hatching, and a hatchling waits a random number of turns before becoming an adult. - At the end of every turn (on clicking 'end turn'), a report is generated to sum up the fees paid at the end of that turn and any circle-of-life events which have just happened, eg if an egg has just hatched. Some super exciting gifs to follow, as always. After today I won't have access to my dev machine for nearly a week, so I'll be working on the monster and UI designs instead. It's probably a good thing, because the programming is my favourite part (and I'm learning a lot about Unity in the process, yay event-based messaging systems) so this'll force me to pay attention to the visuals. Hopefully my shameless placeholders won't be lasting too much longer. But either way, the next feature will be traps, so that catching wild monsters is more interesting, and to start giving more use to that currency. Been working hard and learning lots. It's all still very much WIP and incredibly likely to change, but as much fun as it was to just focus on the programming, the sludge that is Unity's default UI got to me eventually. So then I started to think about how I wanted it to actually look, and was entirely undecisive and uninspired, so changed tack and mused on how I wanted to do the monsters. And in coming up with ideas I stumbled upon images of people making paper/cardboard monsters from pinning random parts together and thought it looked super neat. I also reminded myself that the primary goal of this game is to actually finish it, and having a simple, easily reproducible and consistent style could only be a boon. So I started to doodle up some of my own monster parts, and the idea for the UI itself being made out of layered paper was born and I've been obsessed with it since. I love minimalist art and some of the pieces made purely with sheets of single-coloured paper are beautiful! I think it's a good starting point, anyway. To that end, I'm staying with B&W monochrome for now, because if the UI can be read and interpreted well working just off its values, then adding hue and saturation in the future should be easier. But I kinda like the grey look for now. To complete the paper effect I rolled my own button-press functionality, so it (hopefully) kinda looks like a raised piece of paper with the words cutout. 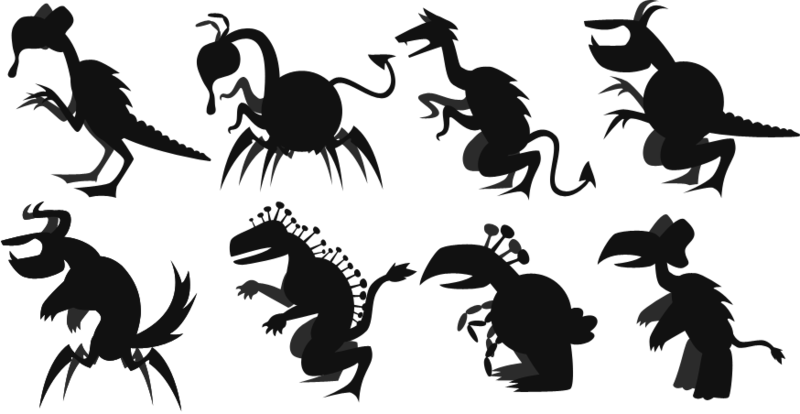 I've also made about 25 monster pieces (all of which will be refined or replaced in the future - swapping out placeholder for placeholder, yay!) and created 5 premades, for now, just so that I could naively swap out the DQ sprites without changing any of the other monster functionality. Getting the part-swapping with genetics is a priority for the near future because that's the bit I'm really looking forward to getting my hands on... but it's gonna be a big chunk of work to get right. At least I've already got a semi-functioning tool to get me going. Just got to resist the urge to expand on it and neglect this game. I've not yet finished converting over all the UI to this style, so there's still plenty of Unity sludge left in the other scenes and pop-ups, so I'm gonna wait until I've finished a full UI pass before going over the trap mechanic that I added. Fonts used are Sloppy Hand from http://designalot.net, which is 100% free to use, and Paper Cutout from http://kimmydesign.com/, which is free for non-commercial use. You had me at the title! Just looking forward to more monster designs! Not bad variety for only ~25 placeholder pieces, I think! It's now possible to see at a glance what genders are and whether monsters are tired/pregnant, rather than having to click on them or try to drag them to the relevant parent slot. And I added a simple 'selected' indicator which is just a pale circle behind the selected monster right now. And man, getting that to work, and figuring out its intended behaviour for all edges cases, was a whole bag of 'things I take 100% for granted in other games' so that was fun to think about. I think making games involves a lot of that, makes you realise all the little tiny decisions that need to be made just to make it functional and nice to use, the sorts of things that the average user just doesn't notice. Assuming its done right, of course. I said that I'd explain the new mechanism for catching monsters, so I'm skipping back in time a little and pretending that it always looked like this. It's now possible to buy and own items, which is limited purely to two kinds of trap right now. The whole inventory/shop interface will get a massive overhaul in the future but its functional for now, which is my priority, just like most of the features so far. After buying traps, and navigating through the map to a wild area with monsters (as seen here decorated by whimsical foliage shapes), you can place them in pre-set slots designed exactly for that purpose. And then when the turn ends, each trap has a chance to either: catch a monster, be damaged, or be destroyed. There is also a non-reusable trap which is destroyed on capture, and a reusable trap which isn't. Which is all very simplistic so far but its all groundwork for adding complexity in the future, hurrah. As you can see from the available tools, monster trapping is a highly sophisticated and technologically advanced business. Most exciting for me is that I now have a full week off work - which means lots of time to spend on MH! Because of this, I've decided to finally tackle the most important part of this whole venture as 0.8... the monster genetics. Next time I post some monster pictures, they'll have been generated entirely by their genetics. Get hype. Breeding games are my jam! I even attempted to make a prototype in LOVE because none of the games I've seen hit it for me. This one looks like it will, though! Do you want a tester? Cool. I'm getting strong insect and dragon vibes...and you mentioned birds above. Are you sticking with existing monster categories? Or I guess real animal categories in the case of "birds"?? The more monsterly and unreal the better, in my book. They still look cool, though. I like the colors. And the random bird generator...but I want more madness! @waru: My intention is to have the monsters as varied and wacky as possible! I'm keeping my pool of possibilities limited for now just while I'm developing it, but once the game is feature complete and working, I'm gonna be doing a big final push to add in as many options as possible. I've tried to hit inspiration from all the major animal categories for these pieces... except I've realised that I've forgotten fish exist, apparently. The final game should have body parts based on real and fictional creatures to give as much variety as possible - and maybe allow for players to try and recreate rough versions of monsters/animals that they like, because if all the pieces for a Knifehead-lookalike are there, why not? I toyed with the idea of having separate 'species' which could only interbreed with each other but - c'mon, where's the fun in that?! So every single monster has the same genetic map and can reproduce with every other monster, to hopefully wonderful results. I'm super happy with how easy it was to plug in my genetics engine to the monsters - the thing controlling the gif above is almost exact same as the pokemon bird gifs earlier in the thread, just with some further QOL tweaks and separation of logic. (This means that while I don't yet have a gif to show it, these monsters can produce offspring just like the birds do.) I've got MAJOR plans on ways to improve the genetics engine, because I don't like my 'average out the binary string to get a float between 0 and 1' anymore (as described in the first post) because while that results in superficially good-looking breeding results, it's too far removed for reality for me. I'm going to be moving towards an allele-based approach which lets me define phenotypes (the expressed bit) based on which alleles are present and in what combination, rather than using this fake binary stuff. Awesome, i love genectic like games! I hope I can make a good one! And the genetics are in! Not a whole lot to say here other than there's nothing new here other than I'm successfully mixing the genetics-breeding of the Pokémon birds above with the circle-of-life breeding that was already implemented. (And that isn't it interesting how a lizard and beak-type heads produced all dog-type heads!) Now that this is in and works, I can prioritise improving the actual genetics tool whenever I want, because for now it'll produce results which are perfectly workable and feel close enough to reproduction as to be satisfying. It's also super decoupled from the rest of the game itself, including how the monsters are actually created body-part by body-part after the genes have been set and interpreted, so I've got nice separate areas of code to work on when the time is right. Little somethin' somethin' that I'm working on now. I wonder, with almost no context at all, how do you interpret those map markers? Going from bottom left, mountain, castle, portal, two more castles, monster lair? Progress on the somethin' somethin'. Curious to know how much sense this makes with no explanation. The wiggling makes me way too happy.